Oncorhynchus keta have various lifestyles. They are born in the river and live off the coast. After that they go back to the river they born. We can see them sometimes but they have different form and color. So people call them various names. For example, Tokisirazu, Ginke and Hocchare in Hokkaido. Oncorhychus masou is species of Oncorhychus keta. Oncorhychus masou can grow to 50 meters, 300g~1kg weight and live for one or two years. In the river, they eat plankton and insects that live in the water whereas off the coast, they eat plankton and small fish. Oncorhychus masou belong to Oncorhychus. Other species are Oncorhychus masou masou, Oncorhychus kisutsh and so on. Oncorhychus masou have cinnabar red dot in the back but Oncorhychus masou masou don’t. Oncorhychus kisutsh’s active scope is larger than Oncorhychus masou’s. Oncorhychus masou live in clean rivers and off the coast. The female lives in the river and off the coast whereas a male lives only river. We can see them in the pacific west of Kanagawa, Shikoku and Kyusyu. Oncorhychus masou move to coast from river. They spawn in September to November and in December to January the eggs hatch. In fall their body changes to silver and move to the coast. After they live off coast for a year, they go back the river. Finally they spawn in their native place. Oncorhychus masou are a semidangerd species. So we must protect their habitat. For that we can reduce garbage in the river. There are many Oncorhychus masou’s recipe. For example sashimi, grill with salt, bake with salt and so on. 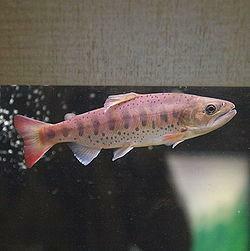 If we would like to see Oncorhychus masou, we can see them at Shimanto river and Niyodo river.